One in ten small* charities ‘don’t have’ or ‘aren’t sure’ whether they have any risk management measures in place to ensure they achieve their objectives and safeguard their funds and assets. The majority (87%) only have one measure in place, leaving them ill-prepared to deal with risk and governance issues, according to a new report Under the radar: risk management in small charities**, commissioned by PolicyBee from the University of Suffolk. Almost half (47%) of small charities are only partially confident in their capacity to identify and assess risk. And more than half (54%) feel less than fully confident when it comes to their ability to manage risk. These figures show a significant proportion are concerned that their organisations may be unable both to recognise a risk in the first place and deal with it, should problems arise. Sixty-four per cent of respondents from small charities cited a lack of time, followed by a lack of funds (52%) as the major barriers to putting risk management measures in place. Lack of expertise was also highlighted by 39%. Six out of ten (62%) had never received risk and governance training - the biggest hurdles being lack of funding (57%), lack of time (50%) and not knowing where to access training (45%). PolicyBee’s Dominique Fell-Clark, who is also founder of The Women & Girls Fund, funding small charities in Suffolk, commented: “At a time when the charities sector as a whole is under increasing scrutiny, the lack of funding and resources among small charities is leading to shortfalls in risk management. This puts many in danger of sleepwalking into a governance and compliance crisis. Risk to funding is the outright biggest concern for small charities in the next 12 months whether that be external funding, including grants (70%) or their capacity to generate income streams (74%). The next most pressing risks are their ability to recruit trustees and staff (62%) and then managing the risks associated with them. What is an ‘operational’ or ‘compliance’ risk? Risk should be categorised by charities in two ways - the likelihood of an event occuring and the severity of its potential impact. Specific examples of poorly managed general risks include a lack of dual signatories on cheques; unidentified or poorly handled conflicts of interest; and lack of induction training for trustees on their legal responsibilities, all of which could seriously affect a charity’s reputation and jeopardise public trust. While risk and governance advice is readily available from a number of sources that support charities, the research shows that many small charities are not familiar with the organisations that provide it. Sixty per cent are not very familiar with seven**** of the main regulatory bodies and umbrella organisations that support charities in the UK. Interestingly, nearly a third had never contacted their local community foundation - these being a major source of grant giving and support at a time when many charities are struggling in the face of dwindling funding. Dr Olumide Adisa, Principal Investigator Suffolk Institute for Social & Economic Research, University of Suffolk said: “Despite the fact that the risks faced by charities depend on the size, funding, and services offered, the case of small charities deserves special consideration because these organisations are often performing essential front-line services in their local communities on shoestring budgets and many smaller charities are more likely to view risk management measures as a drain on resources. 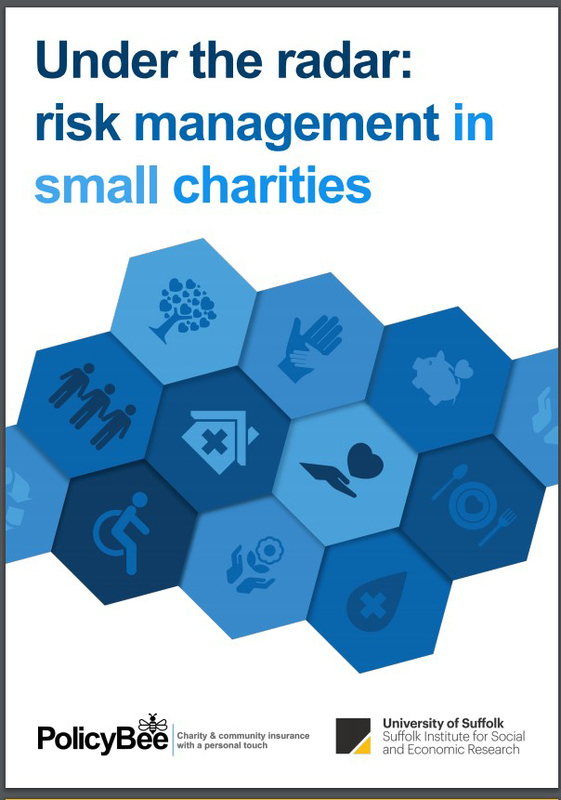 “Understanding how small charities identify, assess and mitigate risks can make a real difference to their longevity and sustainability as it highlights the extent to which different types of risk are dealt with in these organisations and the barriers that remain. PolicyBee has today launched its online Charity & Community Help Hub, to point small charities directly to useful information that can help them. It filters the wealth of charity support advice available and delivers a one-stop-shop platform of essential third-party resources.